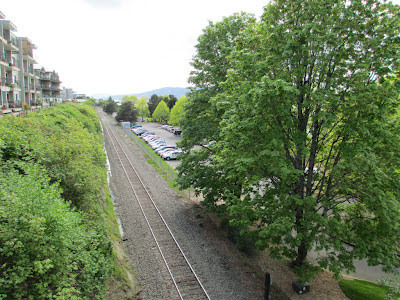 If we get the Gateway Pacific coal terminal north of town, it looks like parking and access to Boulevard Park, in Bellingham, might be in question. A consultant says we might need more siding track to deal with congestion between various freight and passenger trains. Siding that could cut off access to Boulevard Park. A more detailed article has came out in Bellingham Herald May 13 where a railroad spokesperson says that Bellingham siding may not be necessary for the coal port. That siding plan has been looked at as part of the bigger picture for overall increasing of freight and passenger traffic along the line. It seems like the rail line north of Everett is running pretty close to it's comfort zone for capacity with it's current load. My guess is, the railroad track capacity issue may be a deal breaker for the coal port plans north of Bellingham. Other port proposals, that are farther south, are also vying for some of that coal traffic. Some port proposals in Tacoma, along the Columbia River and in Hoquium area are being considered. Some of these ports may be more shallow that the Cherry Point area north of Bellingham, but they are closer to the mines in terms of rail distance since it seems like the coal has to go through those areas first before it comes up this way. The coal comes west through the Columbia Gorge; probably because that avoids bringing it up over the Cascade Mountains? Maybe we are spoiled? Here in Washington State, we are lucky to be getting most of our electricity from hydroelectric power. China, which burns much of this USA coal, is not so lucky. Some coal trains are already headed through town to a coal port that's just across the border in Canada. Also we may be kind of lucky, here in USA, in another way. We seem to have plenty of natural gas. There is still greenhouse gas worry from burning natural gas for power, but not as much as from coal generally; though there is worry from the process of fracking to obtain much of the gas. Still the big issue of global warming, on a world wide basis, should give folks pause. Maybe we all, including China, need to push more for things like solar and wind energy. Possibly safer forms of nuclear as well. I keep reminding people that for various reasons I transport myself mostly by bicycle. My energy footprint is fairly small compared to many Americans, at least.